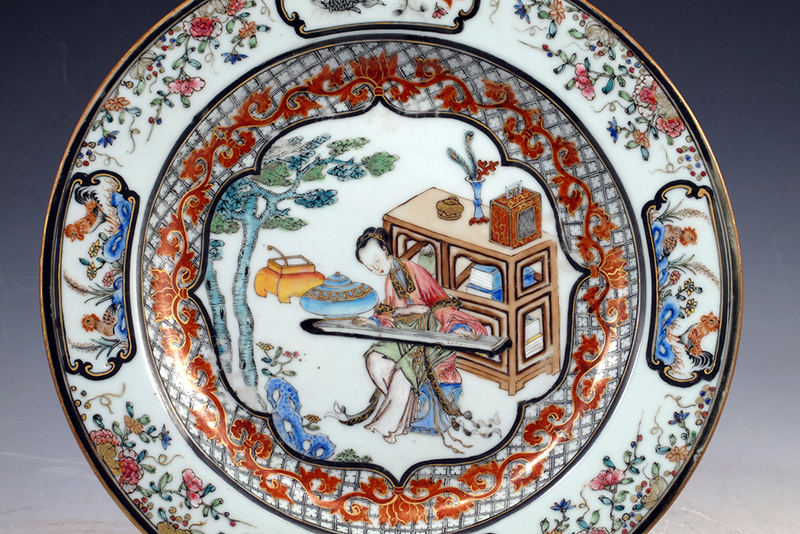 A great example of Chinese export porcelain decorated en grisaille, this very well-rendered 9″ plate is from a small group depicting various scenes from the life of Christ, this one picturing a central scene of the Nativity, undoubtedly taken from prints of the period, all within an elaborate European rococo style border with gilt highlights. Very good condition, other than a small rim chip to reverse. Ex-collection of M. Bascourt, Antiquarian, Antwerp. Circa 1745. 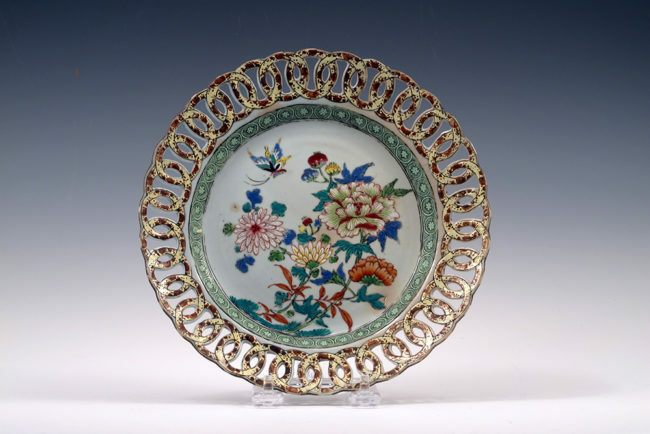 A very rare form, this Chinese export porcelain plate has a wonderful border of openwork interlocking rings, decorated with a mottled effect most likely intended to resemble tortoiseshell. 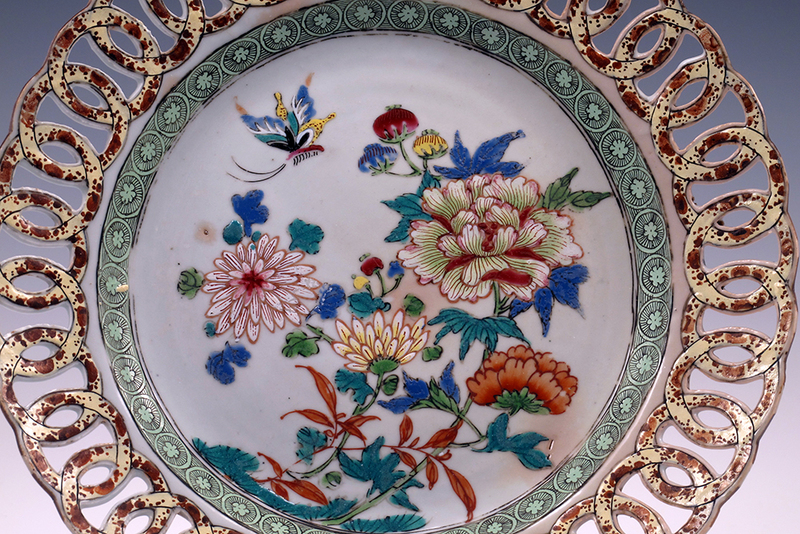 This fine piece is then centered with a beautifully enameled famille rose image of lush flowering peonies and chrysanthemums with a very exotic butterfly. Measuring 8 3/8″ in diameter and in very good condition. 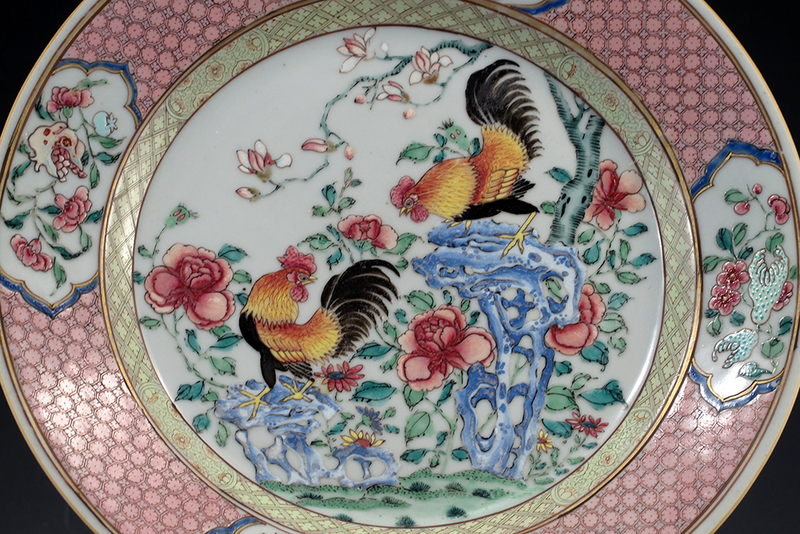 An example of similar form in the collections of the Rijksmuseum in the Imari palette which they attribute to the first quarter of the 18th century, this famille rose example circa 1740-1745. A very lovely and complete Chinese export porcelain five piece garniture set, decorated in famile rose enamels, molded with the design of a flowering pomegranate tree which grows about the surface of each piece, the beautifully modeled vases complementing each other’s shape. 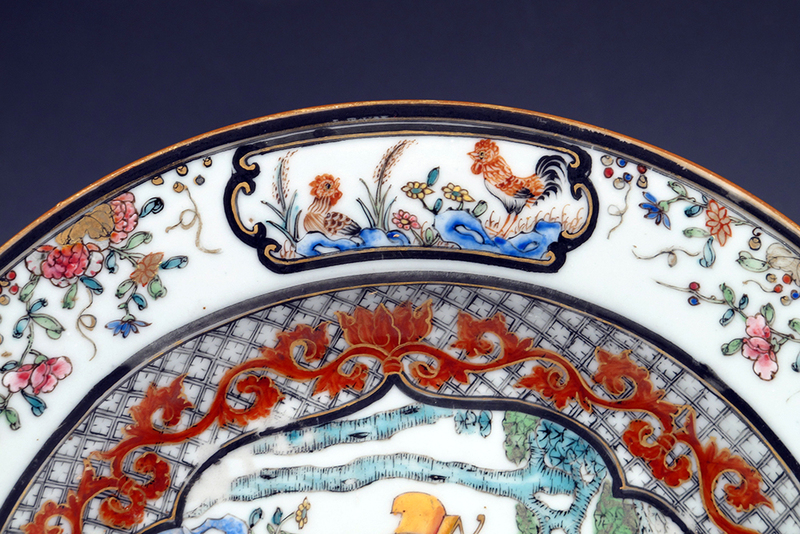 Each surmounted by its original cover with a gilded foo lion and measuring approximately 11″ tall. 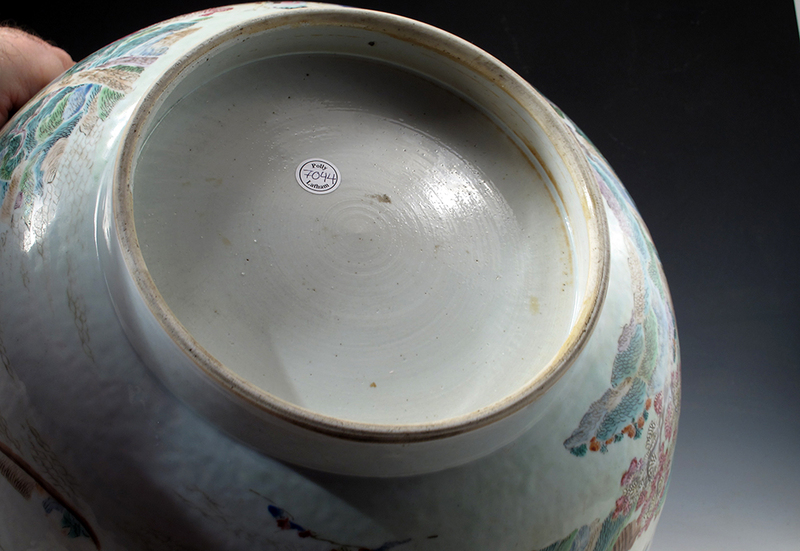 One open vase with a rim chip and the other with a sealed crack on the neck, one foo lion off and re- attached, and some very minor rim glaze losses, otherwise, considering their age and the precarious placement of these objects on chimney pieces over two and a half centuries, very good condition. 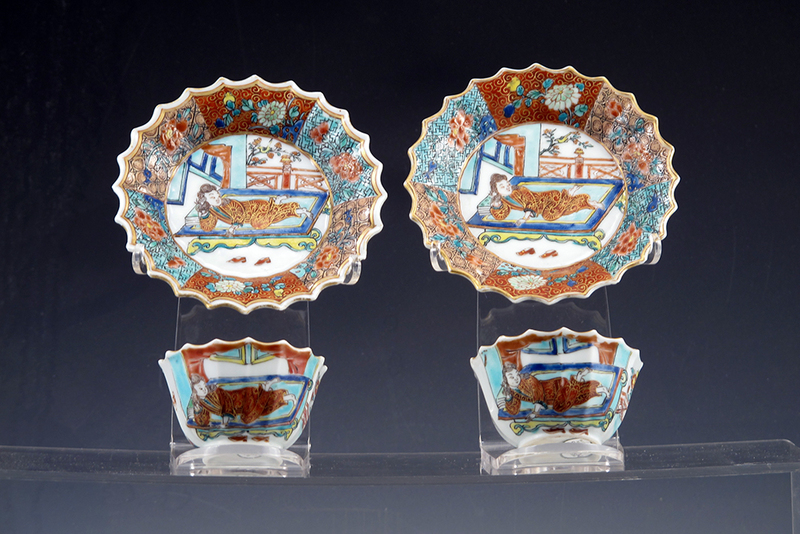 Very decorative and so great to have a complete set. Circa 1740. 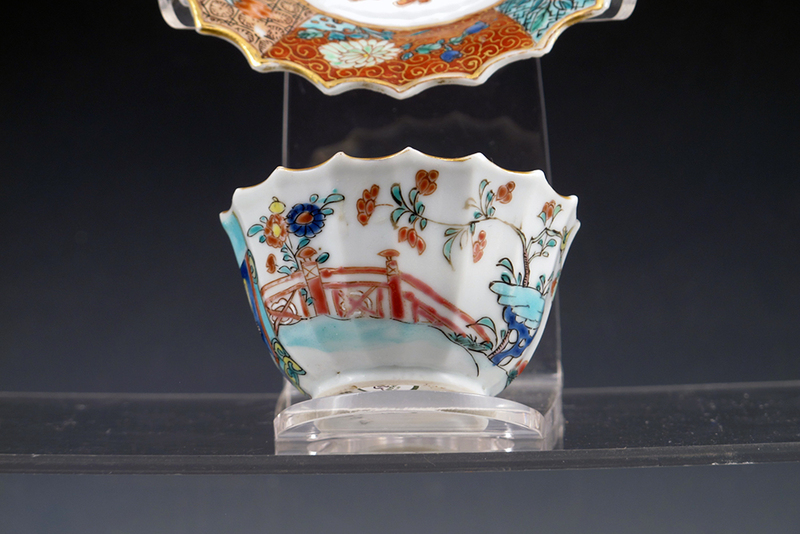 A very large and dramatic 14″ Chinese export porcelain lighthouse form coffee pot, decorated in famille rose enamels with flowering branches of peony and other exotic flowers and birds, the spout fashioned as a dragon’s head, the entire piece a conceit of color and whimsy that would have been appealing to the European market during the rococo period. 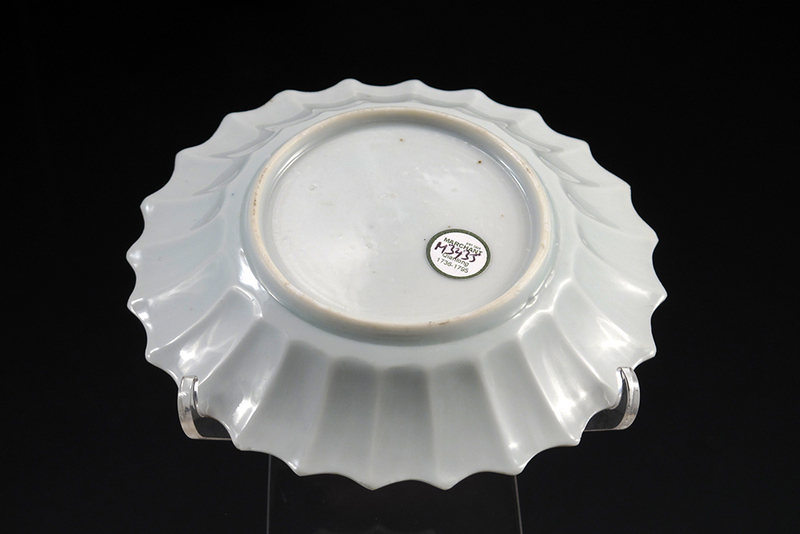 Measuring 14″ x 11″ and in good condition with the exception of a short line to the rim restored and restoration to the spout. Circa 1750. 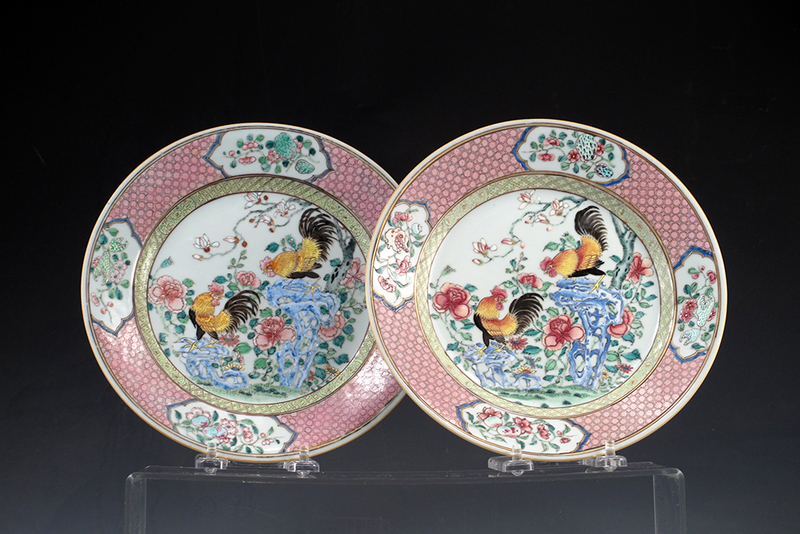 A very elegant pair of Chinese export porcelain saucer dishes decorated in famille rose enamels, each centered with a flowering tree of peonies (The Queen of the Flowers, symbol of wealth and nobility) within a beautifully painted border of lotus petals (the symbol of purity). 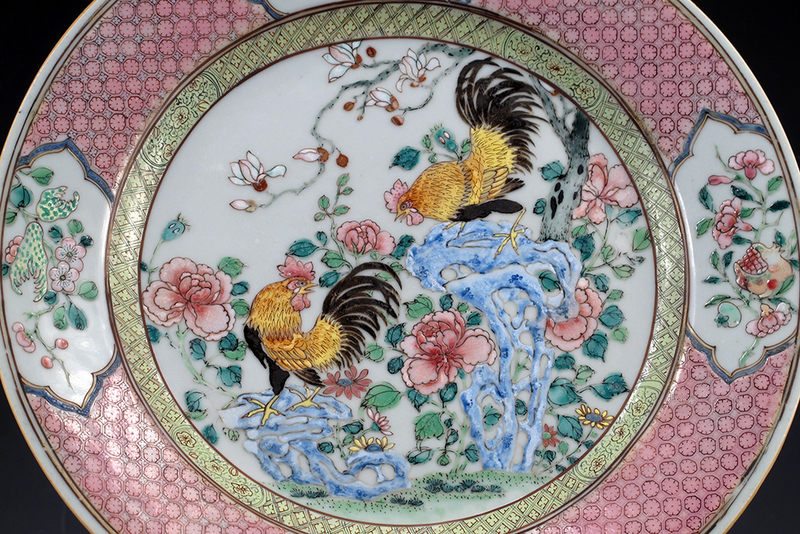 Some minor re-touch to the enamels, otherwise very good condition and measuring approximately 11 in diameter. Circa 1745. 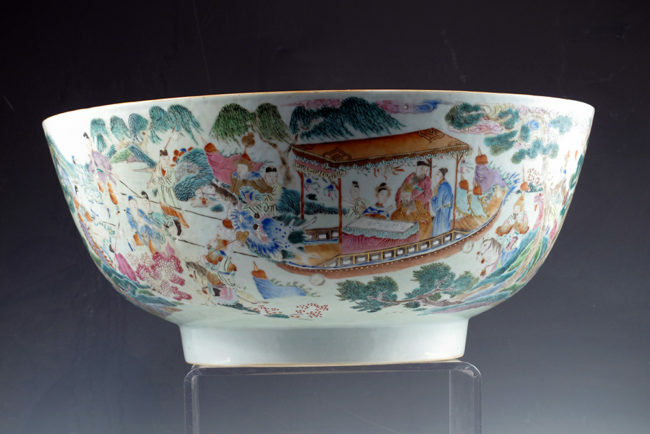 A fine Chinese export porcelain punch bowl of impressive 16″ size and decorated in famille rose enamels with a rather unusual scene depicting a person of high rank, perhaps the Emperor, seated beneath a canopy, in a boat-shaped wagon with a dragon’s head prow, being drawn by attendants and accompanied by a mounted guard, all within a picturesque landscape-perhaps a great celebration such a Chinese New Year? 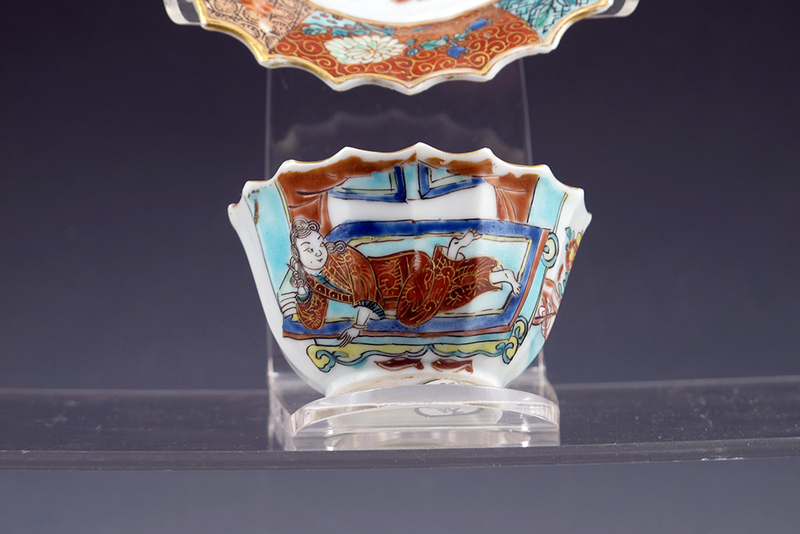 An iron red enameled landscape centering the interior bottom of the piece. Three rim lines sealed, otherwise good condition. Circa 1750. 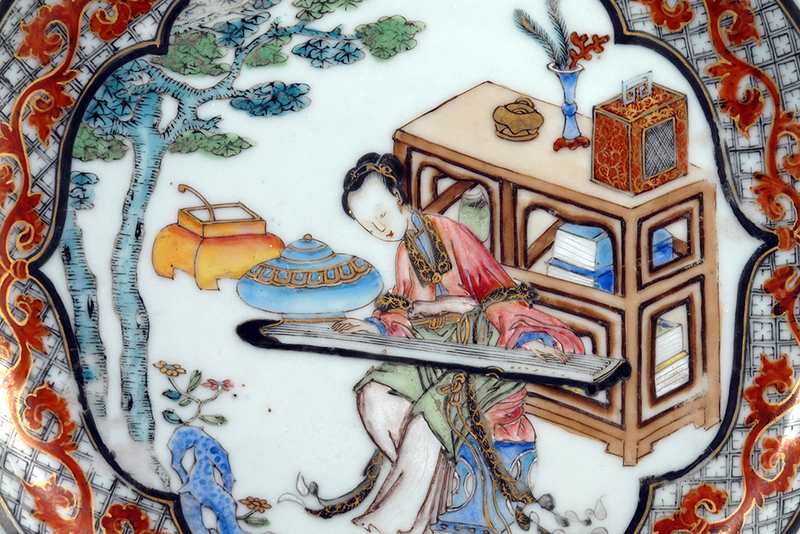 An especially finely decorated Chinese export porcelain Yongzheng period plate, hand-painted in famille rose enamels with an extraordinary amount of skill and attention to detail, centered with a beautiful scene of an elegant lady seated upon a garden seat playing the guzheng, an ancient stringed instrument dating back to the Han Dynasty, behind her a cabinet filled with books and scholarly objects. 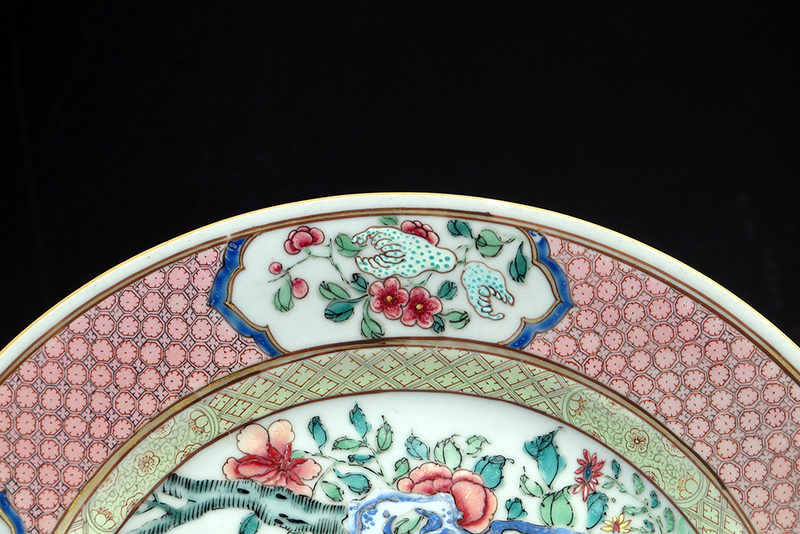 This sense of refinement continues throughout the rest of the piece with beautifully detailed flowering branches of peony, reserves of koi and cockerels and a lavishly designed cavetto with grisaille diapering overlaid with an iron red and gilded scrolling vine. No effort was spared in creating this lovely object. 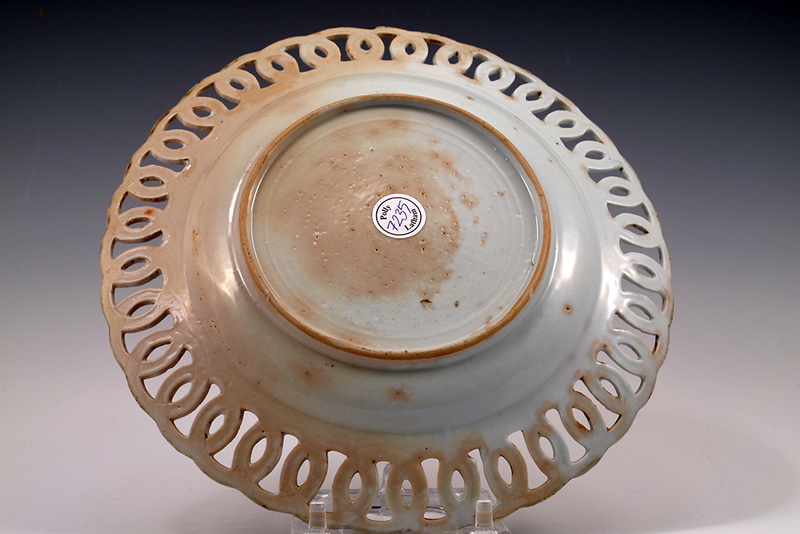 Measuring 9″ in diameter and in very good condition. Circa 1730. 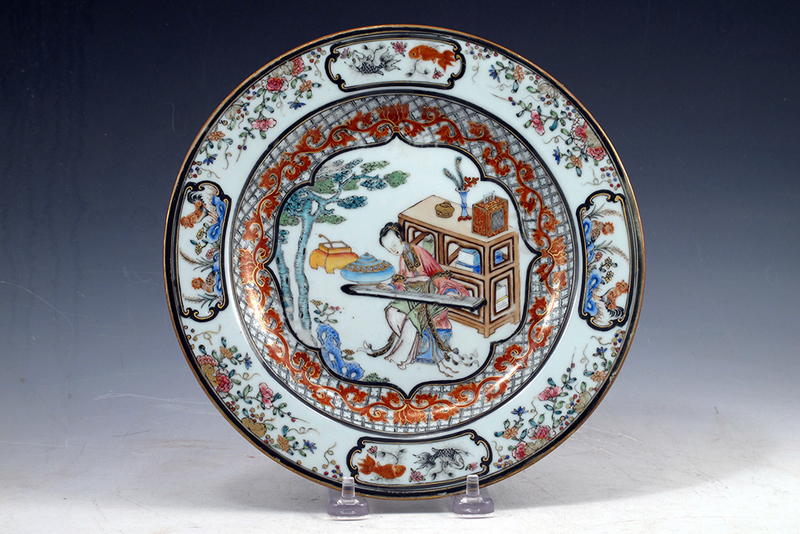 A wonderful pair of Chinese export porcelain Yongzheng period plates, decorated in the Chinese taste in the famille rose palette, with a scene of an official fording a river on a horse with his attendant, carrying another older man on his back, wades through the water, as a bemused fisherman watches the pair, a pavilion on the opposite bank. 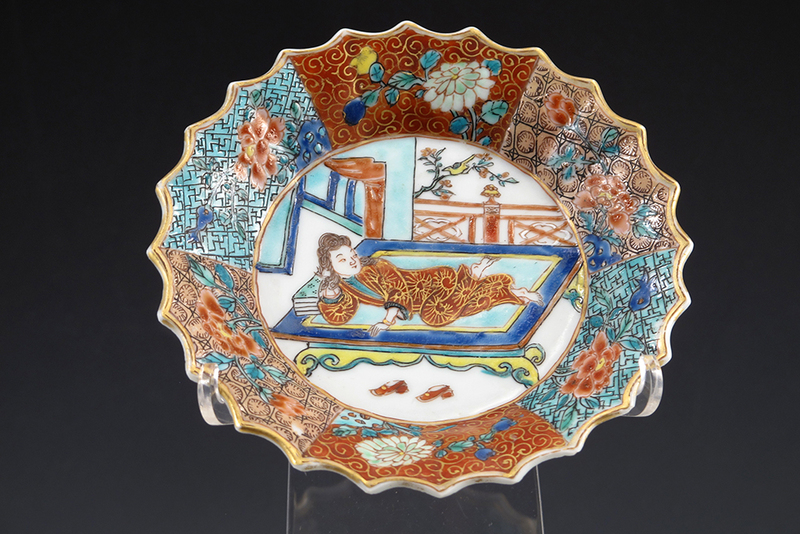 It is noted in The Choice of the Private Trader, that these “borderless” scenes where the illustration covers the entire surface of the plate, along with this combination of colors, are relatively rare and must represent limited commissions for this style of decoration.  Measuring 9″ in diameter, one with a short line sealed, otherwise both in good condition. Circa 1735.